This is proven long ago that protein is contained not exclusively in animal products. In fact, protein is found in all foods. It is very much protein in grains, and the very existence of sejtan proves it. Protein is defined as following: any of a class of nitrogenous organic compounds that consist of large molecules composed of one or more long chains of amino acids and are an essential part of all living organisms, especially as structural components of body tissues such as muscle, hair, collagen, etc., and as enzymes and antibodies. Wheat gluten first appeared during the 6th century as an ingredient for Chinese noodles. It arrived in the West by the 18th century. De Frumento, an Italian treatise on wheat from 1745, describes the process of washing wheat flour dough in order to extract the gluten. By the 1830s, Western doctors were recommending wheat gluten in diets for diabetics. In the United States, the Seventh Day Adventists promoted the consumption of wheat gluten beginning in the late 19th century. 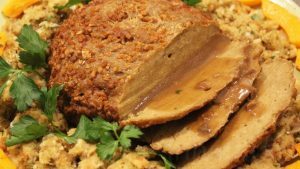 Seitan is called “wheat meat”, because it is a pure vegetable protein with the addition of fiber. It can be prepared at home and the process does not require complex equipment and is not time consuming. Spices: pepper, asafoetida, bay leaf, green cardamom etc. – Mix the flour and water. – Cover the bowl and leave the dough sit for 20-30 minutes. – Put a pan in the sink and fill it with warm or cool water. Get the dough and rinse it in this water, squeezing your hands from all sides. When the water turns white, replace it with some fresh water and continue to rinse the dough. – The dough will gradually become yellow or grayish in color. Do not forget to change the water when it is white. – Continue until the washing water has become transparent and there are no white impregnations in the doug. That means, that all the starch is washed off and only the wheat protein remains.This lump will look like chewing gum and will be 4 times less than the original amount of the dough. Get seitan out of the water and squeeze out the excessive water. – Make a broth. To do this, boil water, add salt, bay leaf, and your favourite spices. The flavour of the broth should be quite intense because the taste of the seitan depends on it. – The resulting semi finished product (wheat protein) should be cooked in this broth for 20-30 minutes. It’s amount will increase by a factor of 2. You can pre-cut it into several parts, especially if you are cooking a large amount at once. – Finished wheat “meat” can be stored in the same broth in the refrigerator for several days. The ready seitan can be fried, stewed, baked. It easily takes on the flavors of your favorite seasonings. It’s also protein-packed (60 grams per cup! ), cholesterol-free, and low-carb. Today, one can buy seitan in the produce section of many stores, and a variety of companies use it to create delicious vegan alternatives. Most of the flavor in these vegetarian hot wings comes from the sauce, so be sure to use a really good quality one. Try a slightly sweet mango hot sauce or a hot sauce made with pineapple, or, try it out with any sauce you like. Prepare seitan by chopping or tearing it into chunks a little bit bigger than bite sized (about 2 inches). You can also slice your seitan into thin slabs or “finger” shapes. Heat a thin layer of olive oil in a skillet over medium-high heat. Sautee the seitan until lightly browned on all sides, stirring frequently (about 5-10 minutes). Reduce the heat to medium low and add the hot sauce, maple syrup, lime juice and salt stirring to combine well. Reduce the heat to low and allow to simmer for about another 3 to 5 minutes, stirring to coat the chunks of seitan well with the sauce. TODAY’S TIP: Tofu, tempeh, and seitan are all products that can be used in place of meat. Although very different, they are all delicious and can be used in a variety of ways.